Phenomenal sunsets! Incredible coastline! Punta San Carlos in Baja Mexico is gorgeous. It’s also a Mecca for outdoor adventure in the form of camping, mountain biking, surfing, kiteboarding, and paddle boarding. However, it’s definitely no luxury beachfront hotel resort with plush rooms and drinks at the swim-up pool bar. A trip to Punta San Carlos involves driving eight hours south of the border in Baja Mexico. The last two hours are across 60km of a very rocky dirt road. When you arrive, you will need to set up a tent on an exposed windy and sunny cliff unless you have an RV. Either way, you have to truly love extreme sports to end up camping in Punta San Carlos. You will be about three hours from any food, water and supplies so pack wisely. A hat, sunscreen, and deep blue rub were essential for this trip, among other things. You’ll also need to find a way to create some shade in this beautiful barren oceanfront desert cliff. Our jenky tarp set-up helped a little but was no match for the 25mph wind by the third day. We plan to improve our camping game next year with some fence posts to tie our shade to. We also want a Yetti cooler so the ice lasts longer than a few days. Despite its proximity, it’s a different world from San Diego, though no less beautiful. Its a destination that can be ranked along with Fiji and Mauritius for perfect kitesurfing wave conditions. Summer is the best time to catch a perfect south swell with a side-offshore wind. It also has incredible mountain biking trails and stunning sunsets with ALL of the colors! Perhaps the best part is that it’s almost free! Gas and food were our only real costs. We devoured carne asada steaks and tacos cooked on our camping stove after two days of kitesurfing. We also enjoyed a few bottles of wine while we gazed at the amazing sky above the remote seaside cliff. However, unless you are ready to embark on a serious off-road and extreme sport adventure in Baja Mexico, just enjoy these beautiful pictures that take you away to a better place. Although, if you decide you have to go there but you don’t want to rough it, check out Solosports. For about $2700, they will fly you in directly from San Diego on a tiny plane for a week stay. They provide a tent camp, three cooked meals, private showers, internet access, a bar, lessons and gear for watersports and mountain biking. Thanks Sharona! Looking forward to seeing you in Baja soon! This is a lovely place. Your pictures bring alive the sea so vividly, I could almost feel the sea breeze and the scent of salt. Thank you! It’s a very remote but beautiful place. Glad we were able to bring it to life for you. Oh my goodness what an absolutely beautiful looking place- I could just imagine walking along that shore! Thank you! Yes, walking along the clifftop is amazing with views in all directions! Look at that water! Gorgeous. This looks so relaxing. Thank you! It is very relaxing. We could sit and watch the sky and watersports for hours there. Wow its stunningly beautiful. I’d love to visit! Thank you! It is quite an adventure getting there, but worth it when you see it – especially if you enjoy watersports! Thanks! It was one of the best sunsets I’ve ever seen! Photos are gorgeous – I’m having a bad travel itch lately and this made it worse! Thank you! I hope you can get out and travel soon! Yes, it was great for two nights. We needed to be better supplied to stay much longer. What a beautiful place! I would love to go camping on the beach here. Thanks, it was definitely an adventure! It looks like a really amazing place. I would love to go there with my husband. Thanks – it is quite amazing and unspoiled! Sounds like a super rough journey. However, it also sounds AND looks worth it! Thanks, you are spot on – a rough journey but well worth it! You are so smart to rig up the shade that way. What an absolutely beautiful place! Ha ha, well – we will hopefully do a better job with shade next year but we made the best with what we had! Thanks! This looks so amazing! I need to go here! Thanks, I’m happy you enjoyed the post! Thanks, I hope you are able to do a weekend getaway soon also! This one was a blast! Now that would be a perfect place to camp! Beautiful! Thanks, it was pretty amazing! If you are going camping on the beach, this sounds like the way to do it! 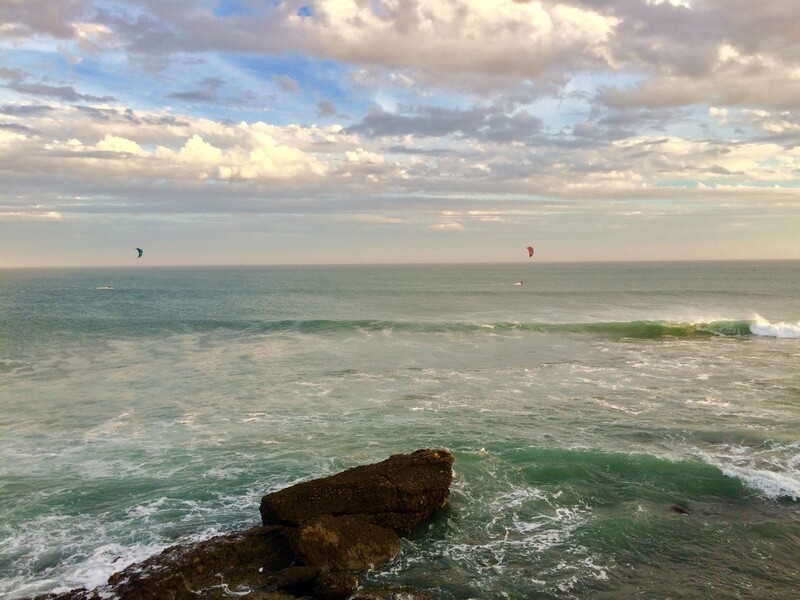 The ocean view is gorgeous, and though the idea of kiteboarding kind of scares me, it looks absolutely thrilling. Thanks! Well maybe someday you will take some lessons and give it a try – it’s a blast! When people think Mexico, they most like think Cancun or Riveria Maya. I’m glad you brought this amazing place to attention. Thanks! Yes, even though the Baja peninsula is part of Mexico, it’s a very different place than mainland Mexico. It’s also well worth exploring. Many people drive all the way to Cabo from California. Oh wow, the scenery here is stunning. You are making me want a beach day now! Thank you! I hope you get your beach day soon! Look at that sunset!! I would love to put this on my bucket list!! Thank you! It was probably the craziest sunset I’ve seen in person. Looks fun and your photos were beautiful! Thanks for sharing! I’m glad you enjoyed it! Thanks for chiming in! These pictures are stunning, sounds like an amazing trip! It was! In so happy you enjoyed it, thanks! Awesome, spectacular photos! I would love to try this! Oh you definitely should. Be careful though – it’s addictive! What a beautiful place! I’m putting this on my bucket list! Great! Well feel free to contact us if you ever make plans and we can help! Amazing photography. That place looks beautiful and peaceful. Thank you – it was quite scenic! Very beautiful. Pinned it to my “See the World” board. Oh that’s great! Thank you! I love mexico. I have been to Baja, Cancun and Cabos. Always fun. Oh I love those destinations also! Beautiful! Didn’t know about this place. Will have to look more into it! Yeah it’s off the beaten path but beautiful nonetheless! This is beautiful! I love the water! It looks so peaceful. Thank you – it is an amazing place! Sigh. What I’d give to be there! Ahh well I hope you can travel soon! Oh my! These pictures are amazing. How lucky you are? Adding to my wish list. Thank you for sharing! And thank you for sharing! I hope you make it sometime! This looks absolutely beautiful! I have never been camping on a beach before. I would love to try it sometime. We have beaches here in Michigan. Of course, they are lake beaches. They are just as nice, too. This looks like such a fun experience and very peaceful. Camping on the beach is definitely something you have to experience sometime! Punta San Carlos looks absolutely breathtaking! I might need to make good use of that SoloSports deal! Yeah it looks quite a bit more comfy than my tarp and tent setup! Being by the sea is just such a treat. The sea air, sea salt, the scenery, the water, everything. Camping on the beach sounds just incredible and now I am wanting to head her for a holiday! Great adventurous trip you had, punta san carlos , a nice place to be. It was definitely a great adventure, thanks! Beautiful! I would skip the extreme sports, but would happily enjoy those views while making a dent in my reading pile! I don’t blame you – always nice to catch up on reading on vacation! Wow, it looks beautiful! Wish I were there! I already wish I was back there also! Given the amount of stress I’ve had today, this post brought me a tremendous amount of calm. Looking at those beautiful pictures made me wish I was on a beach for sure, and you just reminded me that I have Deep Blue rub and I really need it right now! That’s great! I wish you a stress free week! ugh! definitely going on my togo list! Glad we inspired you to go, thanks! Very pretty pictures! Makes me want to see what hidden treasures I have near me. Thank you, I hope you find some treasures! Your pictures are stunning. Makes me want to pick up the family and just go! Thank you! Glad we inspired you! Wow. This pictures are gorgeous. I’e never given much thought to camping on the beach. Is the price per person? Thank you – I think it is $5 per person but this year no one even was there to collect! Absolutely – you will forget about everything else on a trip like this! Punta San Carlos looks surreal and your pictures are breathtaking! I’d love to go there! Thank you – I hope you make it sometime! This looks fantastic! I’ve always wanted to go surfing and my family and I ride dirt bikes so this sounds perfect! Awesome- we were just talking about how we need to bring our dirt bikes there sometime! Punta San Carlos is so romantically beautiful, just like in a movie. I’m a huge fan of sea and the waves. You captured it perfectly. I would say it is beautiful. The shade thing stinks but wow what views. I am living vicariously through your Instagram photos. Such a scenic and tranquil destination! So relaxing. Awesome thanks! We will do our best to keep them exciting! So freaking gorgeous! I’m definitely not about roughing it to that extreme yet (still haven’t been camping) but I love the beach and those sunsets! Maybe one day I’ll get to go. Great thanks! And you can always go the Solosports route which is certainly more cushy! Wow it does look gorgeous! I would love to go there. Thank you – we hope you make it there sometime! Absolutely gorgeous pictures. I’ve been to many places in Mexico but have yet to travel here. Thank you – we do love Mexico! All the scenery is so beautiful! You are making me want a beach day! Thank you- enjoy your beach day! Your photos really highlight the landscape and the water! What an amazing adventure! I would love to visit and spend some time in this beautiful natural spot! Thank you – I hope you get out there soon!